Earned leave is the leave which is earned by the employee for working for a certain period. The central government employees are entitled to get 30 earned leaves (ELs) per year, along with this earned leave they are also entitled to get 8 casual leaves (CLs) and 19 notified holidays. As per the 7th pay commission, the central government employees should avail 20 earned leaves every year and they are allowed to carry forward only 10 earned leaves to the next year. Every central government employee (except military officers & staff working in Vacation dept) entitled with 30 earned leaves per annum in Two Installments, here 15 days of advance ELs will be given on the 1st day of January and remaining 15 days on the 1st day of July. Persons working in the vacation department such as a teacher, principal, headmaster, librarian, laboratory assistant and waterman in school will credit with 10 days of earned leaves per annum in 2 installments, 5 on 1st January and remaining 5 on 1st July. Military officers are entitled with 60 days of earned leaves in every year. under sub-rule (4) of Rule 5 of the Central Civil Services (Joining Time) Rules, 1979 central govt employees will get 15 days of joining time to join in the new post. If they don’t utilize these 15 days or if they avail only a few days then remaining days will be credited to earned leaves. Remember these earned leaves and unvailed joining days should not exceed 300 days at the end of every half year. If they exceed 300 days then the extra days will be paid as LTC (Leave Travel Concession). As per the 7th pay commission, it is mandatory to avail 20 days of earned leaves before 31st December of every year, and only 10 earned leaves will be carry forwarded to the next year. Central govt employees can avail a maximum of 180 earned leaves at a time if they stay in India. 300 days of earned leaves will granted to the central govt servants at a time if they spend entire leaves or portion of those leaves outside India, Bangladesh, Bhutan, Burma, Srilanka, Nepal, and Pakistan. The leave days spent in India should not exceed 180 days. Earned leaves will be credited into the leave account of the central government employees at the rate of 2½ days for every completed calendar month. (2½ x 12 months = 30 ELs per Annum). Under rule 11 of the CCS leave rules 1972 the central government employees are entitled to get 8 casual leaves (CLs) for a year, for industrial workers 10 CLs, and for defense officers 20 CLs and for defense PBORs (Personnel Below Officer Rank) 30 CLs will be entitled in every calendar year. The other category employees like Railway employees will get 11-13 days of CLs per year. 1. The number of CLs allowed per a central government employee will change according to their joining date, if an employee works for 1 year completely then he will get complete 8 days of CLs. 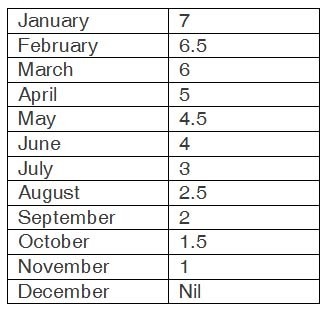 But in joining year the no of CLs allowed will be based on his joining month, here is the table of CL allocation as per joining month of the employee. 3. Like earned leaves un utilized casual leaves will not carry forward to the next year. 4. Employees can utilize casual leaves for half day also. 5. whenever an employee takes a casual leave, it should be taken with prior approval from the superior officer, and make sure that it will not cause any inconvenience to the public. 6. Casual leaves (CLs) can be combined with special casual leaves and vacation leaves but not combined with earned leaves (EL), extraordinary leaves(EOL), and half pay leaves (HPL). 7. General holidays like Saturdays, Sundays and public holidays fall in between casual leaves or before after casual leaves will not be considered as casual leaves. Compensatory leaves (CO) are the leaves that an employee will get for working on holidays such as Saturdays, Sundays and public holidays. Central government employees can take a maximum of 2 compensatory leaves at times. There is no limit for compensatory leaves, employees should avail the accumulated compensatory leaves within 12 months from the date of accumulation.